Home » Evangelistic Improvisation » Song Study: There Is Power In The Blood » How Should It Sound? Below is the song as it would appear being played with the O/C. If you want to print this out and take it to the piano, then (1.) Click on the music to open it in a new window, and, (2.) Print the contents of the new window (select File, Print, etc.). Please remember, though, that your goal is not to play from this piece of music. 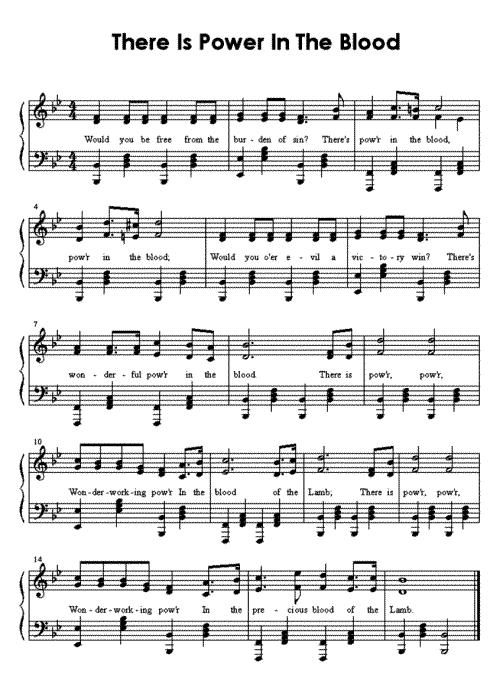 Your goal is to play this (or something similar) by looking at and interpreting the music as it appears in the hymnal. This version is only for reference! One final aspect that should be addressed is the style in which this music should be played. There are two schools of thought on this, which differs widely from church to church, denomination to denomination, and even different geographical regions. The first method is usually found in liturgical churches among classically trained musicians. These demand a strict adherence to meter and rhythm, with every note rhythm sounding exactly as it is written. Often this is referred to as "straight eighths" (as opposed to "swung eighths", which will be discussed next). Interestingly enough, it is often classical players who resist improvisation the most, since it's "inexactness" is contradictory to the specific nature of classical music. This style can be heard in the MIDI file below. The second method is usually found in less formal churches. It makes use of a swung rhythm when playing eighths or dotted eighths and sixteenths, which is why it is usually referred to as "swung eighths". Instead of each eight note receiving half of the beat, the first receives about 2/3 of the beat, and the second receives the remaining third of the beat. This effect can be approximated by saying "Hump-ty Dump-ty". Often the dotted eighth and sixteenth note rhythms receive the same treatment, making them indistinguishable from eighth notes. Unfortunately, this modification of how the beats are divided has caused some to equate this style with jazz. While swung eights are indeed common to jazz, they are by no means exclusive to jazz, and should not be regarded as such. This "free-er" interpretation produces a light, happy style, which is very effective when used appropriately. This style can be heard in the MIDI file below. After explaining the two styles, I am often asked which is best when playing in church. Personally, I use both methods, depending on the song and mood needed to be conveyed. Soft, slow music lends itself to the simpler, liturgical style. Faster, happy music lends itself to the swung style. As always the ear is your guide, so listen to what you are playing, and work until you are happy with what you hear.